This book is the first detailed investigation and description of phonotactic sound patterns affecting Khoesan click consonant inventories. It also includes the first quantitative study of phonation types in Khoesan languages, and the first study of phonation types associated with pharyngeal consonants all around. Although bases of OCP constraints have been presumed to be perceptual, this is the first quantitative study showing the acoustic basis of a particular OCP constraint in a specific language. 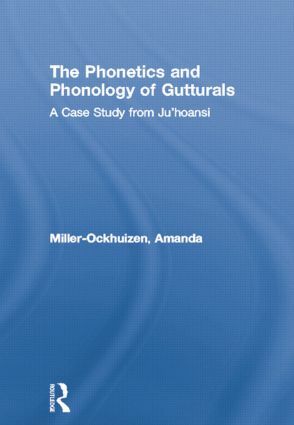 Amanda L. Miller-Ockhuizen describes the phonetics and phonology of gutturals in the Khoesan language of Ju|'hoansi. Hers is the first study of voice quality cues associated with epiglottalized vowels. Thus, it is the first study to show that laryngeal and pharyngeal vowels are unified phonetically by non-modal voice qualities associated with them. It is also the first study to show that in addition to laryngeal coarticulation, whereby voice quality cues associated with laryngeal consonants are spread to a following vowel, pharyngeal coarticulation also involves spreading of voice quality cues. Thus, guttural consonants are united in that they all spread voice quality cues onto a following vowel. Voice quality cues found on vowels following guttural consonants are as large as similar cues associated with guttural vowels. This acoustic similarity is shown to be the basis of a novel Guttural OCP constraint found in the language, which is demonstrated to exist via co-occurrence patterns found over a recorded database of all of the known roots. Thus, this is the first book to provide a detailed perceptual basis of an OCP constraint. The database study also reports several other novel phonotactic constraints involving gutturals, as well as a reanalysis of the well-known Back Vowel Constraint. This book describes both phonetics and phonology of the natural class of guttural consonants, and shows through a quantitative acoustic investigation how the phonetic cues associated with these sounds are the bases of phonotactic constraints involving them.